After eight weeks on the job, Jeff McSweeney is still in awe of his new workplace. Considering that workplace is the Mabel Tainter Center for the Arts in Menomonie – a historically designated, internationally recognized gem – the feeling might not change anytime soon. “When you walk in here, you’re just awestruck,” McSweeney said during an interview on the stage, which offers a performer’s eye view of the opulent curtains, elegant wood molding, hand-stenciled ornamentation the theater is famous for. The ornate theater, built by lumber baron Andrew Tainter in honor of his daughter, who died at age 19, has served Menomonie since 1890. McSweeney, who became the Mabel Tainter’s executive director in June, is excited at the opportunity to become part of the theater’s history. McSweeney, a native of Illinois, most recently was executive director of Youth Music Illinois in Peoria. His varied career has included positions at a number of arts centers – including the Savannah Civic Center in Savannah, Georgia, where he was marketing director – as well as directing alumni relations at his alma mater (Eureka College in Illinois), working as a professional photographer, and fundraising for a Christian ministry in Peoria. Considering this résumé, what appealed to him about the job in Menomonie? “The community – without being cliché,” he explained. And that community has a strong sense of ownership of the Mabel Tainter, he has learned. McSweeney will need support from the community to help the Mabel Tainter thrive. While the relatively small, 280-seat theater “matches the size of the community perfectly,” McSweeney said, its size also can make booking acts a challenge. Bigger acts can bring the venue a certain cachet, he said, but they need to be willing to adjust their fees when they play a venue the size of the Mabel Tainter. The theater has just unveiled its 2018-19 season, which includes everything from Menomonie Theater Guild productions to a cappella stars Tonic Sol-fa to Japanese taiko drumming to a screening of the silent version of The Phantom of the Opera with live organ accompaniment. 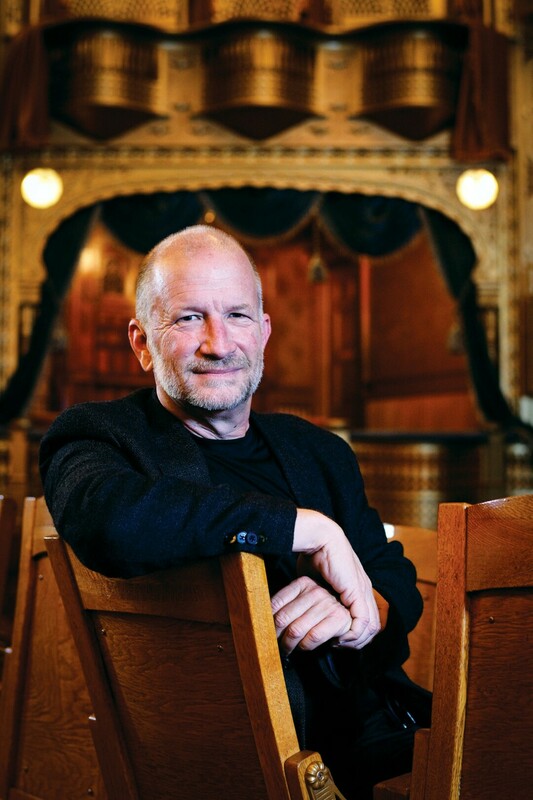 McSweeney said the Mabel Tainter must continue to appeal to longtime theater-goers with tribute acts and the like but also has to reach out to others who haven’t been to the theater recently – if ever. “I want this building full,” he said. “There are people who live in Menomonie that haven’t been in the building and they walk by it every day, and you’re just like, ‘Come into your theater, see what’s going on.’ ” Among other initiatives, McSweeney hopes to appeal to these potential patrons – particularly UW-Stout students – with a new comedy series, “The Mabel Laughs.” In the future, he’d also like to offer more film screenings, a kids’ series, and more performances of classical, baroque, jazz, blues, and other kinds of music. In addition, he hopes to foster more use of the building – which includes a little-used art gallery and a variety of public rooms – for weddings, business gatherings, and other special events. The Mabel Tainter’s 2018-19 season opens Sept. 20 with the first installment of “The Mabel Laughs” series featuring headliner Jakey Emmert. Learn more about the arts center and its upcoming productions by visiting mabeltainter.org, by calling the box office at (715) 235-0001 ext. 100, or coming to the theater itself at 205 Main St. E in downtown Menomonie.